Ready for cooler weather! Paired up with long-sleeved tee shirt and leggings, over-the-head jumper made of colorful chenille. 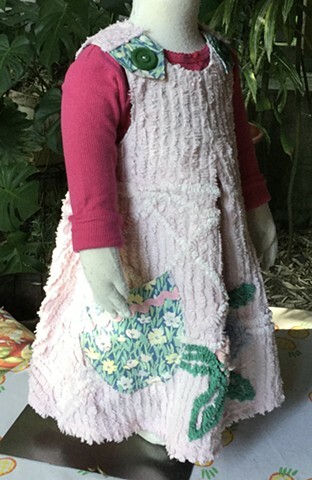 Size Pre-School (3-4 years), measures 22” armhole to armhole, 20” length shoulder to hem, closes at shoulders with big green buttons, faced with blue floral print. Slanted pockets with rick-rack, deep front and back pleats, 100% cotton, washable, $70, made by the designer herself and shipped free to any address in the U.S.